The NHS can be trusted to handle patient records despite the loss of thousands of personal details, the boss of the health service says. The Tories and Lib Dems want a planned database of 50 million patient records in England to be reconsidered. But NHS chief executive David Nicholson said the losses were taken seriously and the new e-records system would be more secure than internet banking. Eight trusts are reported to have lost 168,000 patient details in total. The losses emerged through checks ordered after the loss of 25m child benefit claimants' details in November. Mr Nicholson told BBC Radio 4's Today programme: "I can absolutely assure you that clinicians, professionals and people like myself take this sort of thing very seriously." He said the level of security for the proposed new database system - part of the £12bn upgrade of the NHS IT system - would be way beyond, for example, the level currently in internet banking. "This is a very high level of security. There isn't going to be a huge national database," he said. "What we're talking about is a series of regional databases that are connected together." But the e-records database will still mean patient details can be accessed anywhere in the country by NHS staff with the access rights. Dr Richard Vautrey, deputy chairman of the BMA's GPs' Committee, said he was not reassured by the development of regional databases rather than a single database. He said: "The regional databases are still extremely large. MPs have been concerned about identity cards - they certainly should be concerned about this project because of the amount and type of information that's going to be held on these databases. "Certainly we believe that smaller units would be more sensible and practical - and actually would probably be cheaper to work as well." And shadow health secretary Andrew Lansley said the data loss was further evidence of the government's failure to protect personal information. "We will need further steps on the part of the Department of Health to show how their planned electronic patients' database will protect our medical records," he said. And Lib Dem health spokesman Norman Lamb said spending on e-records should be suspended. He added: "The loss of hundreds of thousands of patient records, highlights the dangers of centralising patient data." But the government indicated the latest episode would not prevent plans for the national patient database from going ahead. The Department of Health confirmed that one of the breaches involved the clinical details of 160,000 children by City and Hackney Primary Care Trust, after a computer disc failed to arrive at its destination at St Leonard's Hospital in east London. It also said an additional 8,000 patients may have been affected but only a small proportion involved some clinical data. A spokesman added: "There is no evidence that this has fallen into the wrong hands." The other trusts involved are Bolton Royal Hospital, Sutton and Merton PCT, Mid-Essex Care Trust, and Norfolk and Norwich. The East and North Hertfordshire PCT reported a loss but has since found its missing data. A further disc, lost by Gloucester Partnership Foundation Trust, consisted of archive records relating to patients treated 40 years ago - none of whom is still alive. 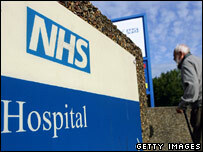 Maidstone and Tunbridge Wells NHS Trust has reported two breaches - meaning that 9 cases have occurred in total. The losses involved data stored on laptop computers and data sticks. A ninth trust was also reported over the weekend to have lost patient data, but the government has now confirmed that this involved staff details. It has also emerged that NHS Grampian health board has lost patient records eight times in the last five years. A week ago it was revealed the details of three million learner drivers had been lost after being sent to the US.